Native to the Pacific Northwest, Douglas Fir is one of the strongest North American softwoods. Its qualities make it one of the first choice for contractors to use for such things as framing for buildings, bridges and railroad ties as its ideal for structures that need to withstand high winds or earthquakes. Its stiffness also makes it great for flooring. 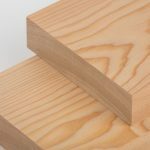 Some woods can shrink, crack or twist as moisture levels change, what makes Douglas Fir such a popular choice is that it retains its size and shape as it seasons. The Kiln Drying process subjects the Douglas Fir to drying cycles while maintaining consistent temperature and humidity levels. This drying process helps to further increase stability, reduce checking and maximize equalization within the wood. Traditional air drying of wood can take days, Kiln Drying can be done a lot quicker, making it more cost effective. Bugs and insects are also killed during the drying process. Here at Longhouse, we use coastal Douglas Fir products from sustainably sourced old growth Vancouver Island Douglas Fir to manufacture structural products such as timbers and beams perfect for roof decking and flooring. The tough nature of Kiln Dried Douglas Fir make it the perfect material for high traffic residential and commercial applications. Available in many head turning finishes, and also fire treated with our class A non-toxic retardant for commercial properties. The wide plank solid flooring adds a bold statement to any room. Longhouse Specialty Forest Products is proud to be FSC® certified by the Rainforest Alliance since 2007. FSC® is the only Forest certification system that environmental groups like Greenpeace, The sierra club and WWF support. Longhouse supports sound forest practices and effective management of forest resources for future generations to enjoy.